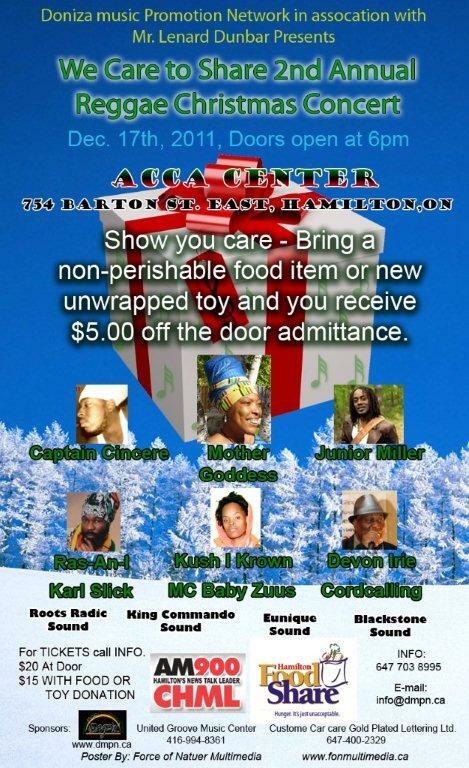 We Care to Share 2nd Annual Reggae Christmas Concert on December 17th, 2011 at 754 Barton St. E. Hamilton, Ontario. Doors open at 6 pm. Christmas is a time to give and receive. 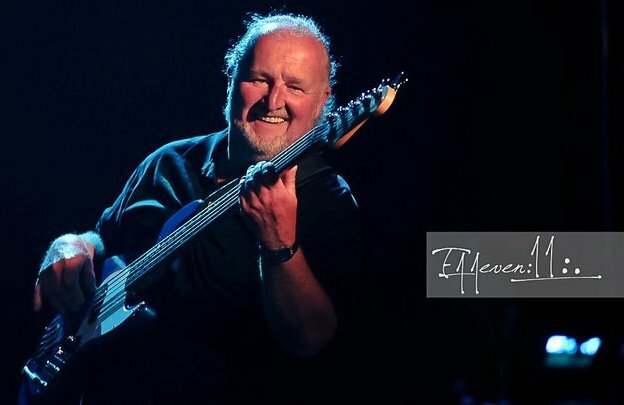 A unique night out to enjoy live music and support Hamilton Food Share and the CHML toy drive - Bring a non-perishable food item or new unwrapped toy and you receive $5.00 off the door admittance. Live music will be performed by Cordcalling, Karl Slick and son, Junior Miller, Donna Buchanan (Mother Goddess), Ras-An-I, Devon Irie, Captain Cincere, Kush I Krown. Dance music by Roots Radic Sound, King Commando Sound, Blackstone Sound, Eunique Sound. 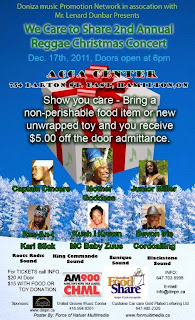 Cost is $20 at the door or $15 with a donation of non-perishable food or unwrapped toy. Parking – on the street and the church parking lot. This is a wonderful event, fun for all and helps those in need. Cordcalling will be opening, followed by Karl Slick and son with special quests.